HTMLGIANT / Daniel Beauregard Release Day Interview Party! Daniel Beauregard Release Day Interview Party! 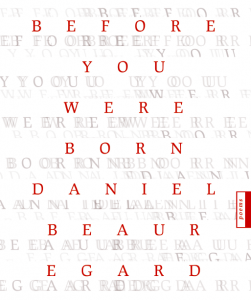 Today, my new press, 421 Atlanta, releases Daniel Beauregard’s debut chapbook, Before You Were Born. First things first: you can order it here, or here if you want to get a great deal on both it and Publishing Genius’s newest chapbook release, The Kids I Teach by Andrew Weatherhead and Mallory Whitten. Speaking of Publishing Genius, I thought I’d take a page from PGP man (& BYWB designer) Adam Robinson’s playbook and post a quick but savory Q&A with my author so that HTMLGiant readers can get to know him a little better! It was really interesting to think about Daniel’s poetry as an interviewer instead of as a publisher, and I was very excited to see his thoughtful and candid answers to my questions. And here they are! How did dreams, objects, and found texts interplay with your process in writing the poems in your new chapbook? Dreams played a very large role in writing the poems found in “Before You Were Born.” In a way I feel many of the poems were dictated to me through my subconscious—at times I woke in the middle of the night after a dream and the dream became the poem. Other times, things came more sporadically, a line at a time. When I added the lines together they made sense. Or they didn’t. I have a dry erase board next to my bed and if something comes in those hours between waking and dreaming that is important to me, I straggle out of bed and write it down usually without turning on the light. Then I go back to bed or, if the lines keep coming, I’ll turn the light on. Objects played a large role in writing the poems as well. I was obsessed with the way things can be continuously broken down then built into something new. Like an atom bomb or a pulsar. I didn’t rely on found text in these poems as much as I have in my more recent work. However, there are a lot of bits and pieces I’ve picked up along the way that have wedged their way into the poems—conversations, arguments, emails. And how about The Simpsons? The Simpsons is always somewhere inside me D’oh. There aren’t many references to the show in “Before You Were Born” but I did steal a line from Superintendent Chalmers. It’s from a scene when Chalmers and Principal Skinner are walking in the parking lot and Chalmers shows Skinner his new car. Skinner says: “It gets me to from A to B—and on weekends, point C.” I do have several other poems that reference the show though. There’s something about the poems in Before You Were Born that seems, not personal exactly, but private. How do you think about audience and the reader? There is something that’s a little private in those poems because, in a way, it’s asking the reader to take a step into my mind—to see the things that I obsess over; the things I rant about. Tiny particles. Dust being bits of skin. Swamp lights and the souls of dead children. I don’t like to think about the audience and the reader too much. I like the idea of the reader looking into a glass house. You can throw whatever you want at it but the house will stand or melt into something else, all the while a part of me will remain. These poems are an exercise in understanding myself—they are very much selfish. Lately I’ve been interested in how caves can be used as a larger metaphor for language. I haven’t thought too much about it yet but I’ve begun studying caves via various texts and hopefully over the next few months I can visit some caves myself. I’m interested in how life can thrive in the depths of these caves without any sunlight—bacteria, viruses, extremophiles—not exactly sure where it will go but I’ll continue playing with the idea of desiccation, dissolution and creation. I’ve also got another project titled “HELLO MY MEAT” that I finished recently. It’s a series of loose sonnets created from words and phrases found in various anatomy texts, letters from sea, captain’s logs, butcher manuals and sea diaries from the early 1900s.